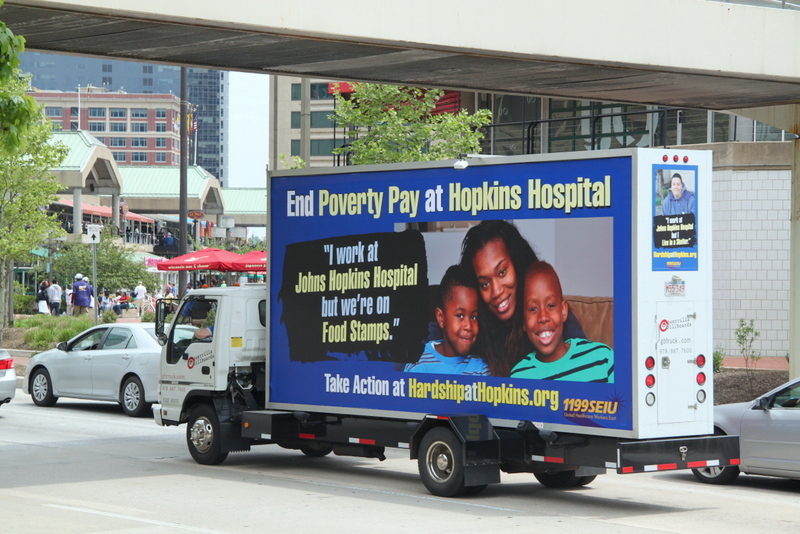 Above: The union had this truck cruise Inner Harbor streets during its May “Mothers’ March for Justice” rally. Today’s win by 1199SEIU in reaching an agreement with Johns Hopkins Hospital calling for higher wages is a textbook example of a sharply focused campaign that combined old-fashioned union organizing with modern social media. Representing 2,000 janitors and service workers, the union turned the Hopkins “brand” as a world-famous medical center into a public relations nightmare for management. 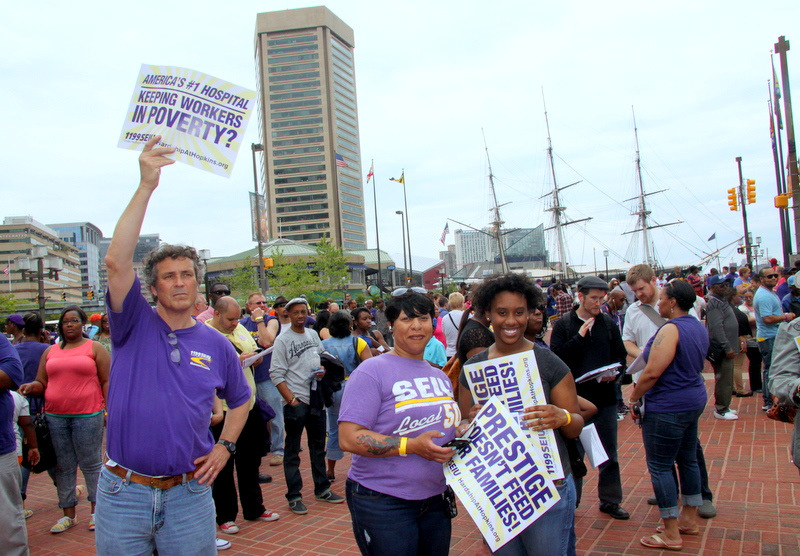 The union used some time-honored labor techniques, including a surgical three-day strike in April and a mass rally at the Inner Harbor in May (with some participants bused in from D.C., Boston and Long Island). But what may have turned the tide was the union’s deft application of Twitter, Facebook and other low-cost social media. On its website, hardshipathopkins.org, 1199SEIU posted videos of hard-pressed employees, released tax data on what it claimed to be the extravagant pay of some hospital executives, and related its historical connection to civil rights icon Coretta Scott King. At the same time, a rapid-response team of organizers fed the media detailed email releases of the status of the union’s talks with management. Today, after four months of negotiations, Hopkins agreed to go more than halfway to meet the union’s demands. The hospital will boost wages by as much as $4.30 an hour over the life of the 4½-year contract, and give across-the-board raises of at least 2% every year, with a 2.75% raise in 2017. While some employees won’t exactly be flush with cash – wages will remain as low as $13 an hour – they will be making more than the $12.25 minimum Hopkins had been offering. The two parties met last Tuesday and deadlocked over Hopkins’ “final offer,” which was nearly identical to its original offer in March, according to the union. The breakthrough came early this morning after the union met with management for more than eight hours. In contrast to 1199SEIU’s media activism, Hopkins did little to influence or direct the flow of information about its wages or the “hardships” portrayed by the union. Early on, the institution spoke of its duty to maintain financial discipline and referred, rather condescendingly, to SEIU’s membership as a small part of the nearly 20,000 people who work at the hospital. Any strike by service and technical employees would not hurt patient care, the hospital maintained. Otherwise, the Media Relations & Public Affairs office remained tightlipped, not disputing the union’s claims and telling The Brew and others that Johns Hopkins doesn’t negotiate with employees through the media. While Gov. O’Malley most certainly applied political pressure on the two parties to reach an agreement, the mushrooming cost of 1199SEIU’s Internet campaign on the reputational image of Hopkins was an equally compelling factor in this morning’s settlement. The agreement is expected to be approved in a membership vote later this week.